Just in time for Mother's Day, the next book in the A Letter to My series (after A Letter to My Dog and A Letter to My Cat) takes on mothers, with celebrities and civilians writing letters of gratitude and admiration to the women who raised them, alongside gorgeous, intimate photos. 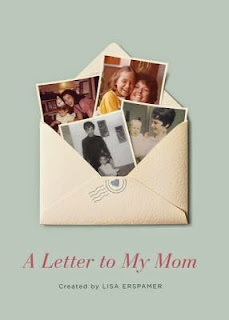 A cute and sweet little book that was easy to read, A Letter to My Mom was an interesting read of personal letters written from children to their mothers. It was a mix of celebrity and non-celebrity tales which made for a nice mix. Some of the letters were short and sweet, especially those written by children, which I found was a nice addition, and some of the letters were somewhat heartbreaking. It centered around a nice theme of gratitude and appreciation which was nice to see. It was also a revelation to see just what some mothers would do for their children. As a mom, I found this book a nice little reminder that this is a common and wonderful experience but that there are hardships and trouble that everyone goes through. It truly is how you act that shows who you really are. This book was fun but something that I found myself having to go back to little by little as I wasn't obsessed with reading on through pages and pages of letters in one sitting. Thank you to Crown Archetype for our review copy. All opinions are our own.